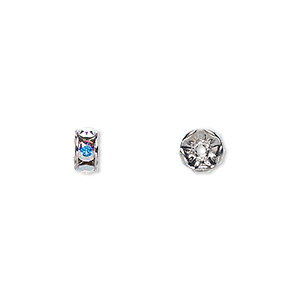 Bead, Swarovski® crystals and rhodium-plated brass, crystal clear, 10x3.5mm rondelle (77510). Sold per pkg of 144 (1 gross). Item Number: H20-8302MB Have a question about this item? Bring your designs into the limelight with exquisite Swarovski® crystal components that shine like a Hollywood star. 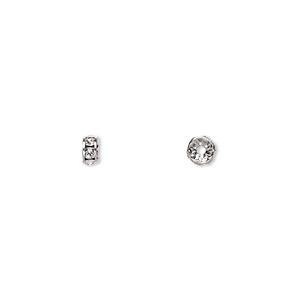 Red-carpet sparkle that's heavily plated for long-wearing style with a smooth, substantial feel. Bead, Swarovski® crystals and rhodium-plated brass, crystal clear, 10x3.5mm rondelle (77510). Sold per pkg of 4. 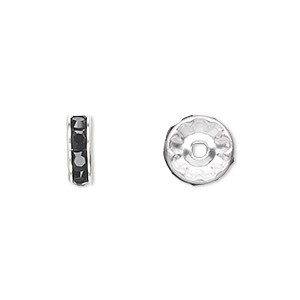 Bead, Swarovski® crystals and rhodium-plated brass, crystal clear, 10x3.5mm rondelle (77510). Sold per pkg of 48. 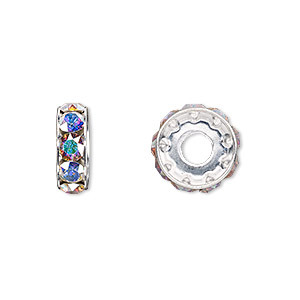 Bead, Swarovski® crystals and rhodium-plated brass, Crystal Passions®, jet, 10x3.5mm rondelle (77510). Sold per pkg of 4.